Zoft Breast Gum - Does Zoft Breast Enhancement Gum Work? Zoft Breast Enhancement Gum is a natural supplement which guarantees “fuller, firmer larger breasts in as little as 30 days” although they recommend you use Zoft Breast Gum for at least 90 days. These claims from a breast enhancement gum seem to be a bit outrageous at best, but Zoft's site does contain some customer reviews. Zoft Breast Enhancement Gum supposedly works by balancing estrogens and other hormones while stimulating breast growth. Zoft also claims to help fight tooth decay, clean teeth after meals, improve concentration, ease tension, improve digestion, and freshen breath. The main ingredients in Zoft Breast Enhancement Gum include a blend of phytoestrogens – plant estrogens which occur naturally in the body and stimulate the production of new breast tissue. These ingredients include Hops Flower, Blessed Thistle Herb, Oat Grass, Black Cohosh Root Extract, Root Mother Wort Herb, Dong Quai Root, Damiana Leaf, Pacific Kelp, Mexican Wild Yam Root, L-Tyrosine, Fennel Seed, Saw Palmetto Berry, and Fenugreek Seed Extract. Zoft Breast Enhancement Gum also contains sorbitol and sucralose, two controversial artificial sweeteners. Sorbitol is known to cause irritable bowel syndrome. Sucralose has been documented as a toxic substance. 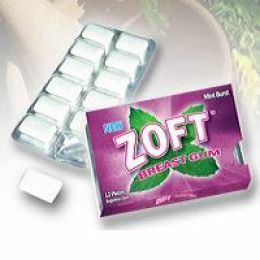 You can chew two to six pieces of Zoft Breast Enhancement Gum each day. However, the manufacturers discourage chewing more than six pieces of gum in a single day. This is likely due to the laxative effect that sorbitol and malitol syrup can have on the digestive system. Does Zoft Breast Enhancement Gum Work? While Zoft Breast Enhancement Gum does include a list of natural ingredients that have been proven effective for natural breast enhancement, we are not confident that delivery via chewing gum will work for breast enhancement. In addition to the abundance of fillers leaving much to be desired, the presence or sorbitol and malitol syrup pose too many risks to the digestive system. Zoft Gum Company does not sell directly to consumers. You can buy Zoft Breast Enhancement Gum online for around $180 for the recommended three months supply. How Does Zoft Breast Enhancement Gum Compare? Click for Zoft Breast Enhancement Gum Results.